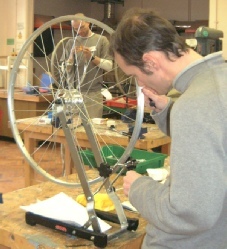 For many keen cyclists, wheel building and repair remain the final bicycle maintenance challenge that they face. And yet―as with hill walking―a little bit of knowledge can be a dangerous thing! Have you ever regretted trying to replace a broken spoke or failed to true a buckled wheel? These days, advice and videos about wheel building are only a mouse-click away on the Internet, but sometimes it is still reassuring to learn new skills in a more personal and guided way, with help and advice close at hand. It’s also a lot more fun learning with others in a group! If you are looking for a way to improve your understanding of wheels, to master a new skill in a controlled supportive environment, to ride wheels you can trust―and to spend a day doing something really satisfying and useful, this is probably the course for you.